Ian Whates (ed. ), Fables from the Fountain. NewCon Press, 2011. Pp. 252. ISBN 978-0-907069-24-6. £9.99. Don’t go traipsing London’s streets looking for The Fountain pub. You might find the Old Fountain, on Baldwin Street, but that’s never the Fountain. This ethereal public house, then, is the rather wonderful setting for an anthology of eighteen tales—eighteen writers given a common setting and a predefined list of characters, and the remit to write up their antics and anecdotes and drinking habits. It’s not a new concept. In fact, the book is dedicated in homage to Arthur C. Clarke, whose work Tales from the White Hart was the first and definitive offering of this kind of conversational, shared-world, linked-story anthology. Where Fables from the Fountain differs is that it’s also a shared-author anthology, and I was interested from the outset to see if each author’s writing style would flow between stories or if each would rub against the other. I wondered given each author uses the same characters just how similar or otherwise the characters would turn out. The book’s editor, Ian Whates, opens proceedings with the story ‘No Smoke Without Fire’. It sets the tone very well, and is written somewhat as an oeuvre that’s intended to introduce and ease us into the setting and characters as much as to entertain as a story in its own right. It’s not surprising, then, that the bones of the story—the rather pun-like idea of how a smoking habit saved a life—begins well into the narrative and is almost an afterthought. But as a scene-setter this opening is perfectly constructed, and most certainly whets the appetite as to what’s to follow. I like Whates’ easy-on-the-eye writing style. It adds a friendliness to this fictitious group of pub oddballs, and draws the reader in without trepidation, as if to reassure this is one group he’d gladly join for a pint or two of Old Bodger and a yarn on a wet Tuesday in Holborn. In ‘Transients’, Stephen Baxter introduces the notion of ‘extra’ characters that might wander into, or be introduced to, the Fountain’s group of Tuesday night regulars. In Baxter’s own words: “A transient is a guest, you might say, who will show up once or twice, who will if we are lucky will have something interesting to say, and if even luckier will have a fecund credit card lodged behind the bar…” Barry Noakes is such a transient (or is it Norrie Boakes? He’s so much the transient that no one really remembers his name) and he brings with him the yarn of the equally (and cleverly) transient nature of signals the likes of SETI might get excited about. What follows is, as with Whates’ opener, very conversational in tone and is deliciously humorous, although a reader without a science bent may feel parts of the story reads like a science lesson. Of course, this is in keeping with Clarke’s original work, and indeed the science in Fables from the Fountain as a whole can seem somewhat esoteric at times. I myself have a science degree, but I wondered at times what was factual and what was artistic license. The boundary is fuzzy in places and the stories are either well researched or written by authors who have some expertise in the field of science. There’s certainly plenty of meat in ‘Transients’, from extra terrestrials to CIA conspiracies, to the periodic table and the physics of star death and more. But then Baxter adds such concepts as the Fountain’s three ploughman’s lunches being the same three prepared in 1946, and these deft touches reassure the reader that all’s not to be taken too seriously, that if you need to skim the science there’s still plenty there to entertain in these stories. Be assured; all’s still well within the Fountain if you like your science in moderation. In ‘Forever Blowing Bubbles’, Ian Watson follows a similar style to Whates and Baxter, and produces a fine, humorous tale of bubble universes and quantum foam and unfortunate flatulence. Must be the Old Bodger, I assume. The science is still there, but as you might guess this one is written very tongue in cheek. Great stuff. On the ‘Messdecks of Madness’, by Paul Graham Raven, sees ‘The Raven’ recount the story of how he ‘left the Navy’. This story is laid out slightly differently from the first three offerings in that while it starts and end as a told anecdote, the crux of the story is related by Raven without interruption from the Fountain’s denizens. This takes us out of the pub somewhat and instead immerses us in the story itself. Such a diversion is not unwelcome, providing that little bit of difference lest we get too bogged down in the conversational nature of the work so far. The story is a twisting affair of alliance and counter alliance and in truth feels more fantastical than science fictional. This slight leaning away from science fiction I also welcomed as something of a breather from the purish science fiction presented thus far. By this point I felt there was a potential problem with Fables from the Fountain in that the stories, though undoubtedly well written and entertaining as they are, begin to feel a little samey. All tend to follow roughly the same format—a brief introduction in the pub, followed by the meat-and-veg of the tall tale told, and finally a short postscript back in the pub where comments may be made or the story’s veracity dissected. I think also that all the stories on offer miss the opportunity to explore the pub itself as a character. Any pub that’s not entirely on the map and yet is frequented by such tellers of tall tales as we are presented with should surely be a character in its own right. Only in ‘The Hidden Depths of Bogna’, by Liz Williams, with it’s brief sojourn to the cellars and the catacombs therein, is the suggestion there’s much more to the Fountain than a meeting place of story tellers. Had I been invited to write for the Fountain (oh, how I wish I had been—am I allowed to say that in a review?) I’d have written a tale told in the grunt of the pipes and the hum of the fridges when the pub was closed and no one was there. Possibly Whates would claim giving the pub more of an active role would produce a different anthology than his remit requires, and if so I certainly wouldn’t argue with that. 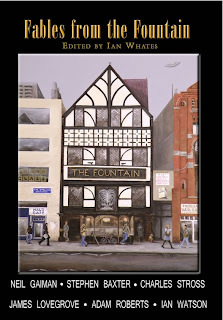 Strangely, there is also one tale told in an Edinburgh pub with barely a passing nod to the Fountain. ‘The Last Man in Space’, by Andrew J. Wilson, is a good story, but why it strays from Holborn I’m not sure. Probably the biggest name in the anthology, Neil Gaiman, provided by far the shortest tale with ‘And Weep Like Alexander’. I must confess to being a big fan of Gaiman’s work, and his tale of Obediah Polkinghorn, the uninventor didn’t disappoint. Except, perhaps I wanted more. “‘…knew a barmaid in Rhyl, back in the late seventies,’ Crown baker was saying. ‘Face like the offspring of a stoat and a hatchet…’” (Liz Williams, ‘The Hidden Depths of Bogna’). “For God’s sake don’t risk the ploughman’s,” Laura warned her new protégée: “the cheese is unpasteurized, and as for the pickle, Graham’s sure it’s recycled from an experimental growth medium for GFAJ-1-” (Charles Stross, ‘A Bird In Hand’). … to quote just two of many fun lines. Then there’s ‘Cyberseeds’, by Steve Longworth, which is a rather awful pun on the Jack and the Beanstalk nursery story, that somehow mixes burger vans and space elevators and magic beans and yet nevertheless works very well. Possibly my only criticism is that towards the end it perhaps tries a little too hard to be funny. But, Christmas Panto will never be the same. And so, to answer my question at the outset—do the characters flow between authors/stories, or do they conflict in style? They flow very well. Whether this is down to Whates’ editorial skill, or whether each author simply nailed each character from the outset, I’ve no idea. But not once did I feel any one character acted, urm, out of character. Fables is probably the closest I’ve ever seen to a multi-author anthology reading like a single-author work. I’m guessing this is what Whates set out to do, and if so he’s achieved it admirably. There’s not a poor tale in here, and but for brevity in this review I could have quoted much good from any of them. Do I recommend Fables From the Fountain? Without a doubt. I read the anthology as a PDF on a computer screen, which in truth is as close to torture on the eyes as I can get, but even then I was lost in the entertainment value of each story. I’d say reading it in book form (in the bath, of course) will be pleasurable indeed. I have to admit to not having read Tales from the White Hart, so I can’t say how Fables from the Fountain compares to Clarke’s original. But, of course, ultimately Fables is its own beast, and will stand or fall on its own merit. All in all, I think it will stand nicely.